Perfectly portable and award-winning Touch technology - Stylish and eye-grabbing, Microsoft RVF-00052 Arc Touch Mouse is more than a pretty device. It’s reliable wireless freedom plus Microsoft touch technology, on the go. Use it just about anywhere, even on a rough wood surface or carpet, thanks to BlueTrack Technology (It does not work on clear glass or mirrored surfaces). Plus you can retain wireless control of your computer up to 30 feet away. Curve it for use, flatten for storage - Arc Touch Mouse’s innovative design allows for quick use and storage. Curve it comfortably to get started. Then smoothly glide your finger up or down the touch strip. When you’re done, keep the tiny transceiver plugged into your computer’s USB port, or attach it magnetically onto the underside of the mouse. Then flatten Arc Touch Mouse to turn it off, and slip it into your pocket or bag as easily as a cell phone. 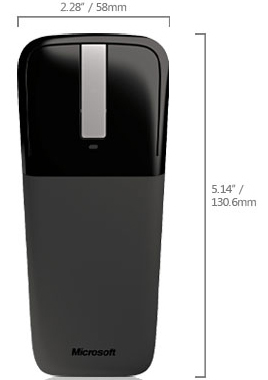 Precise vertical scrolling by feel, not wheel - The Touch strip on the Arc Touch Mouse responds precisely to the speed of your finger movement, using Haptic feedback (light vibration that signals scrolling speed) to scan through documents or web pages as quickly or as cautiously as needed, entirely by feel. Plug-and-go Nano Transceiver - Leave the Nano Transceiver (USB) plugged in when you’re on the go, or stow it magnetically in the mouse. Designed for Comfort - in Either Hand - Superior comfort that’s designed to fit your right or left hand. More Than Six Months of Battery Life - Use your mouse for more than six months without having to change batteries. Battery status indicator tells you when battery power is low. Reliable 2.4-GHz Wireless - Enjoy the 2.4-gigahertz (GHz) wireless technology, which delivers a reliable connection with up to a 30-foot range, with virtually no interference.